ChemDry’s unique approach to carpet cleaning in Oahu Hawaii provides a better experience. Ohana ChemDry uses the power of carbonation to extract more dirt & grime from your carpets, giving them a deeper clean. As well, our carbonated cleaning substances only require us to use a fraction of the moisture steam cleaners require. This allows your carpets to dry quicker and helps prevent the growth of mold and mildew under your carpet. Our deep cleaning and healthy carpet cleaning service is sure to exceed your expectations. ChemDry is preferred by customers and professionals alike. The Carpet and Rug Institute (CRI) designated ChemDry as a company deserving the CRI Seal of Approval for the innovative and unique Hot Carbonating System. ChemDry’s signature cleaning solution, The Natural®, is a cleaning mixture that, through the power of carbonation, lifts dirt to the surface where it is whisked away. The Natural is non-toxic & ideal for homes with kids and pets, and recently received the Green Certification. Well-maintained and cleaned carpet will help ensure a healthy home environment by reducing the amount of dust & allergens present. Your ChemDry carpet cleaning professionals can apply a special carpet deodorizer and sanitizer to reduce unhealthy bacteria in your carpets. Request the Healthy Home carpet cleaning package, which includes our sanitizer & deodorizer formula along with your carpet cleaning, for your next cleaning appointment. We believe Dust Mite Anti-Allergen to be the most effective and safest product available today for surface treatment of dust mite allergens. ChemDry Dust Mite Anit-Allergen is derived from naturally occurring extracts found in plants and trees. It works by instantly deactivating the allergen found in dust mite droppings. Chem-Dry carpet cleaning’s Healthy Home carpet cleaning package is designed to protect your home from allergens which plague most households. The first step in eliminating the dust mite allergen is a thorough cleaning of the home, including hot carbonation extraction of the carpet, rugs, and upholstery. Laboratory studies demonstrated that when dust mite droppings are treated with the main active ingredient contained in ChemDry Dust Mite Anti-Allergen, the allergens are denatured, rendering them harmless to people who display allergic systems to dust mite allergens. Allergens are constantly tracked into the home from outdoors. Some are present in the home because of pets, while others (such as mold) grow in damp areas. Research has shown that indoor carpet environments act as a collectors for these allergens. When carpets are not professionally cleaned regularly, these particles can become airborne. Ask your ChemDry professional for more on how an application of Dust Mite Anti-Allergen can benefit your home. ChemDry’s signature carpet protectant protects your carpets from stains, bacteria and dirt built up over the years of use. Carpet protectant applied by ChemDry could increase the life of your carpet. Over time and with regular wear, factory applied stain resistants will experience a reduction in effectiveness. ChemDry Protectants refresh the performance of stain resistant carpets, fortifying its ability to resist soiling and staining. The next generation of outstanding ChemDry Protectant is here. Not only is ChemDry’s PowerGuard Protectant loaded with acid-dye resistors to provide excellent stain resistance, but its unique polymer base also makes it an excellent protector for solution-dyed carpets like polyester and olefin. Laboratory tests confirm that PowerGuard mixed with The Natural®, out performs all other protectants. ChemDry Repel Protectant repels most liquids, allowing spills to be removed before staining can occur. Repel Protectant can be applied to all types of carpets as it forms a molecular shield around each carpet fiber. This shield increases the surface tension of the carpet fibers, causing them to repel liquid spills, dust and dirt. 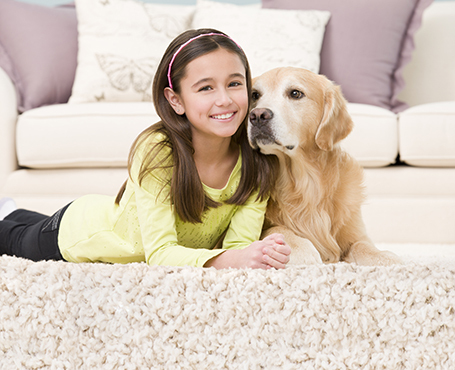 This helps prevent dirt and stains from being ground in or absorbed by the carpet fiber. ChemDry Wool Protectant is a fluorocarbon, water-based product specifically developed to enhance soil and stain repellency for wool carpets and rugs. Wool Protectant is used to form an invisible shield around each carpet fiber to resist soil and stains. The repellency provided will enable most liquid spills to be removed before staining can occur, keeping carpets cleaner, longer.